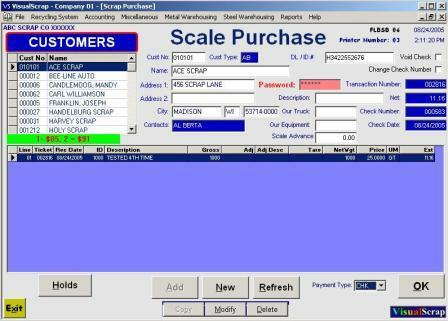 Scrap Purchases scale purchasing is automated and Visual Scrap will print cash tickets, checks or accounts payable receipts at the point of purchase. As a by-product the system captures information for updating inventories, customer product purchase history, and accounts payable records automatically. If you choose not to use the system at the cashier window, you can enter purchase data in the back office. Either way the data is entered only once, while updating all related files automatically. Your operators simply fill in the blanks to enter scale transactions. Customer records, product prices, and descriptions and special customer price quotes are recalled instantly. The arithmetic is done by the computer and extended for you. Customer service at the cashier counter is fast and accurate, with a printed receipt or check done on the spot. The daily purchase journal provides a complete detailed audit of your purchases each day. Daily purchases automatically update the history file. Sales Invoices can be produced and are posted to A/R during the daily sales journal processing. Miscellaneous charges can be entered to A/R. Transactions are kept in an open item status until payment is received. Adjustments to sales invoices can be made easily when posting cash receipts, accounting for weight differences at your customer scale. Sales invoices update accounts receivable and inventory. 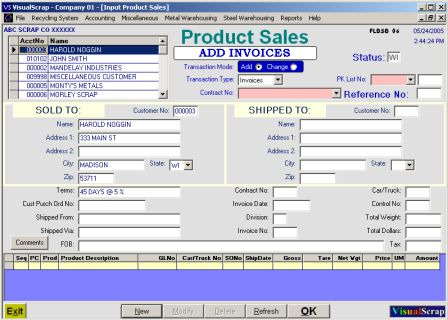 Sales accounting interfaces with the Sales Contract module, if installed.